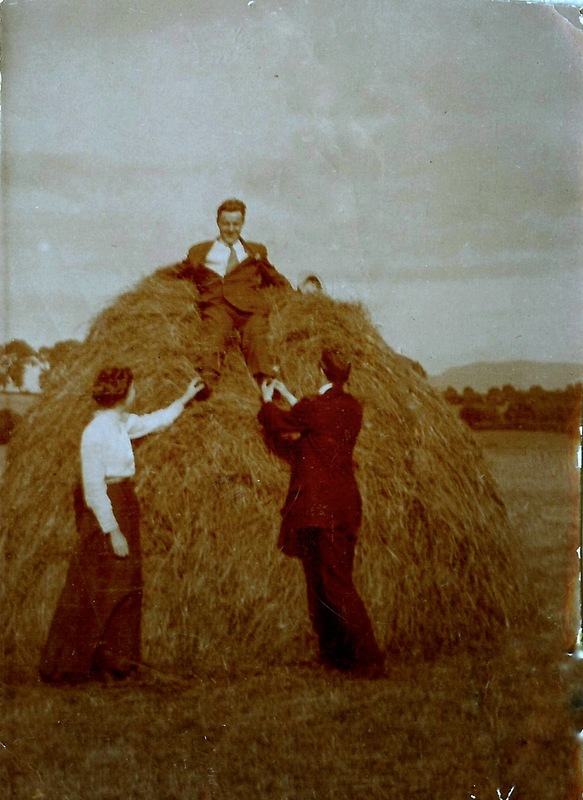 Ned Savage plays in a haystack, Ireland 1913. The man and woman with him are unidentified. From Benita (McGinnis) McCormick’s scrapbook. As I began to search for what happened to Edward Michael “Ned” Savage, I found others who were also researching the Savage family. I was fortunate to connect with one of them, Peter Hannan of Australia. I am grateful to Peter, a descendant of Ned’s maternal grandparents, for sharing information about Ned and his family. It has been wonderful to be able to share with him copies of my great-aunt Detty’s (Benita McGinnis McCormick) photographs of Ned. 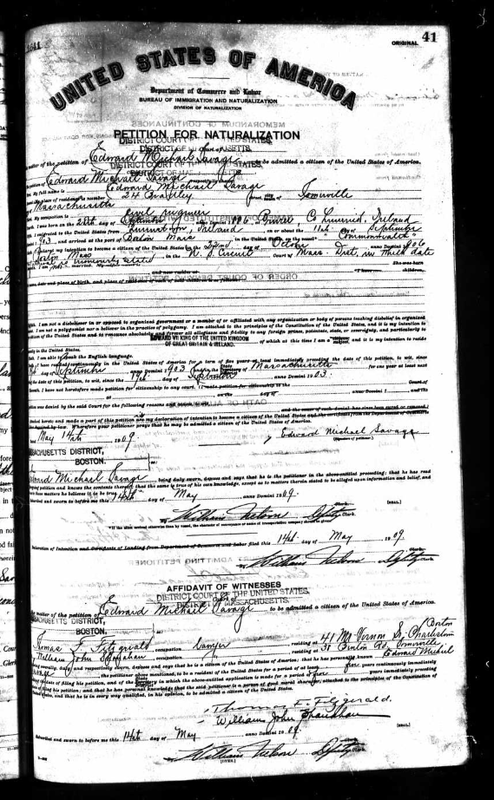 Born in Bruree, County Limerick, Ireland on September 28, 1886, Ned Savage was the youngest of four children of Jeremiah and Annie (Hannan) Savage, Irish immigrants who met in America but returned to their homeland to marry and start a family. Jeremiah had first arrived in America between 1868 and 1870, while in his twenties. A farmer and laborer by trade, he traveled extensively and was one of the early founders of Dickens County in east Texas, where at one time he owned a ranch with 22,000 head of cattle. (1) He had good business instincts and invested in and traded enough railway shares, real estate and livestock to provide his family a comfortable life. Tragedy touched the family in the early 1900s, when Annie fell ill and died, leaving her husband to raise their four teenagers singlehandedly. The date and cause of her death remain unknown, though some Hannan-Savage family stories point to tuberculosis as a possibility. The children, Mary, John, Francis, and Ned were all still in their teens. It would seem she had been ill for some time. The 1901 Irish Census notes that Jeremiah Savage was still “married” and head of a household that included the four children and a servant. By that time, the family had moved from Bruree to Dublin, where they lived in an eight-room home in Rathmines, a suburb of well-to-do families. 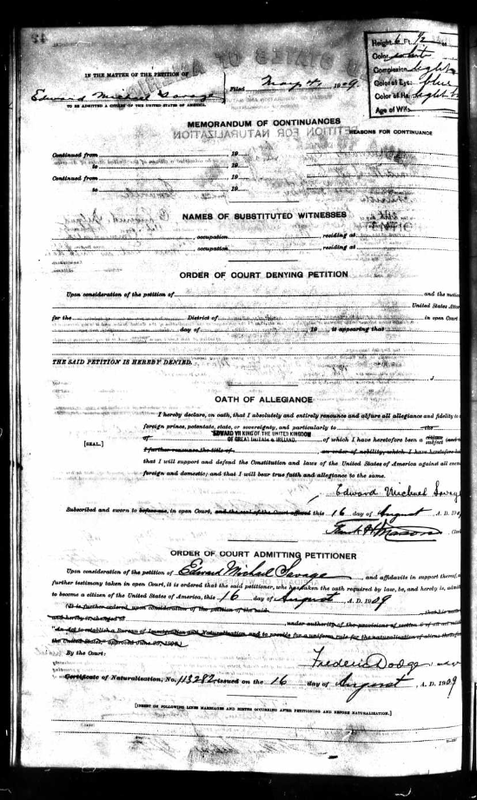 Jeremiah’s marital status and Annie’s absence suggest the possibility that she was still alive and possibly interned in hospital. Tuberculosis is an infectious disease that mainly attacks the lungs, but it can also affect the other organs of the body. Known archaically as “consumption” because of the way it consumes the body from within, the illness thrives in unsanitary conditions and spreads through the air from one person to another. Until the discovery of the antibiotic Streptomycin in 1946, TB was incurable. Its sole treatment consisted of fresh air, healthy food, and rest. The leading cause of death in Ireland in the early 20th century, TB was killing 277 out of every 100,000 persons in that country and often claiming the lives of entire families. It had a stranglehold on Dublin, due to terrible living conditions and lack of effective treatment available. However, its reach obviously was not limited to the poor, as Annie Savage’s family could attest. The social stigma attached to having a family member afflicted with tuberculosis was devastating, if not unfair. Many people during this time viewed victims of diseases like TB as “failures” and avoided their families, in case they were contagious. Hence, Annie’s illness probably had wider repercussions on her family’s relationships with their friends and neighbors. 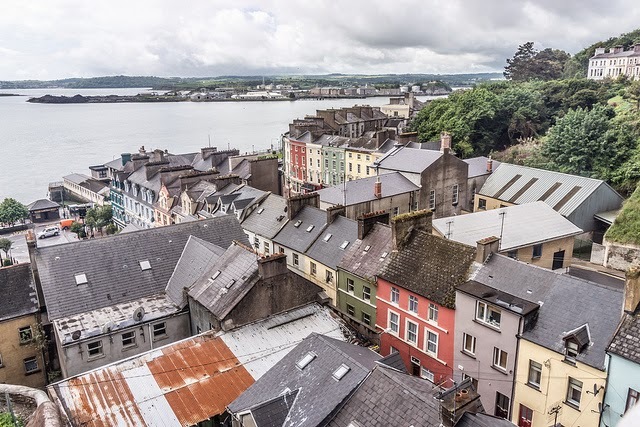 Modern day Cobh, County Cork, Ireland, was known as Queenstown from 1850 – 1920 and was the port of embarkation for thousands of Irish immigrants. The town has probably changed little since the Savage Family left Ireland for America in 1903. Photo by William Murphy, 2012. Courtesy Flickr, Creative Commons. Another plausible explanation is that Annie’s condition left no hope of her ever coming home. Jeremiah might have brought the children to America for health reasons, but maybe he also wanted to protect his children from the pain of their mother’s condition and eventual loss. Either way, it had to be a trying time for him and the children. Imagine the mixed feelings the family experienced during this trip. They had lost a beloved wife and mother. Their native land was in turmoil, struggling with the ravages of poverty and the tensions of the brewing home rule movement. The children probably swung through the poignant arc of adolescence, excited at the adventure before them, yet sad about all they were leaving behind. When they disembarked in Boston ten days later on September 18, 1903, their senses must have been overwhelmed. A light rain had fallen the day before, leaving the rich smells of fall in its wake. Temperatures hovered between the high 60s and low 70s, and the trees were in the midst of their masterpiece palette of royal oranges, reds, purples, golds, and browns. You would have thought Mother Nature had staged a riotous parade to welcome them. Jeremiah’s sister Mary and her husband, William Shanahan, were waiting to take the weary travelers to their home in nearby Charlestown. Jerry Savage eventually settled his family in a two-story clapboard house with a wraparound porch at 24 Bradley Street, in Somerville, a neighboring town. Somerville had been the site of an notorious theft of colonial gunpowder by British soldiers in 1774. The popular outcry that followed the act was a major factor in subsequent events that led to the start of the American Revolution. Jeremiah’s children undoubtedly grew up surrounded by a fierce sense of justice and independence among the people of Somerville. Those values must have resonated deeply in the Celtic hearts of a family whose beloved homeland was still ruled by the British. One day nearly ten years later, that influence would change Ned’s life. Though Jeremiah probably had little formal schooling, it is clear that educating his children was a priority for him. He sent the boys to prestigious universities: Harvard, Boston College, Villanova, and the Massachusetts Institute of Technology (MIT) among them. John Savage became a professor of the classics at Harvard, James became a Catholic priest, and Ned became a civil engineer. Mary was the exception. Instead of going to college, she seems to have taken her mother’s place as the woman of the household and her father’s caretaker and travel companion in his later years, not an uncommon path at the time for the sole daughter of immigrant families. Ned was naturalized as an American citizen in 1909, a year after graduating from MIT with a Bachelor of Science degree in Civil Engineering. In 1910, he left home for a job in Chicago, Illinois, as a civil engineer for one of the railroad companies there. He rented a room in the home of Mary (Gaffney) McGoorty, an Irish widow, and her children. It would be interesting to learn how he came to live with this particular family. Was it random, or were his parents connected in some way to the Gaffneys or McGoortys through their Irish roots? 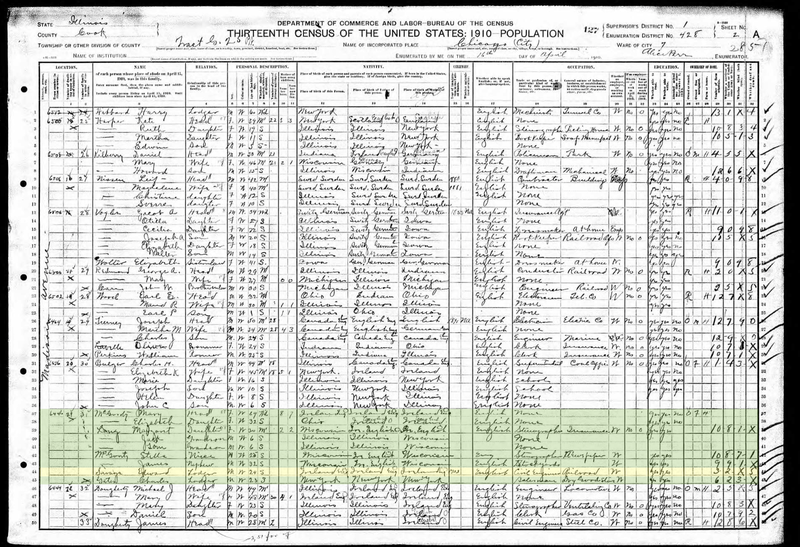 The 1910 U.S. Census listed Edward Michael Savage as a lodger in the home of Mary (Gaffney) McGoorty, at 6446 Madison Avenue in Chicago, Illinois. What was their connection? Though the answer to that question is not apparent, Mary McGoorty did have an interesting and close connection to someone else. Her niece, Mary Jane (Gaffney) McGinnis, Mary Jane’s husband, Tom, and their four children lived a mere two blocks away from the McGoortys. The eldest of the McGinnis children, a graceful slender brunette, was finishing her studies at the Art Institute of Chicago and was a regular visitor to the McGoorty home. The young woman’s name was Benita McGinnis. She was my maternal great aunt. (1) Letter from L. J. Varnell, County Clerk, Dickens County, Texas, to John J. Savage, dated April 20, 1951. (2) Susan Kelly, Stigma and silence: Oral histories of tuberculosis. Oral History, Spring 2011. Beautifully written. You have added such wonderful details from your research – even the weather on a particular day. It all adds so much to the story. Thank you for the compliment, Kathy. The research took some time, but it was well worth it in the end!